A Fresh Focus on Fixed Ops Is Paying Off - Cox Automotive Inc. In 2018, over half of dealership visits included at least two services per customer repair order — indicating that dealers are successfully cross-selling maintenance and repair services. Nearly three in five services completed at a dealership included an oil change, the most common type of work. Significantly, most of the oil change visits also included an additional service. Dealer share of tire work, the second most common service done at dealerships, also has increased significantly since 2015 — an indication that dealers are becoming more competitive and by doing so are improving retention. Dealer capacity impacts customer wait times and most dealers are near maximum capacity. 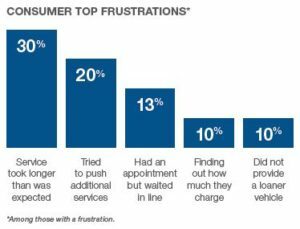 Two of the top five frustrations consumers have with dealers are related to time spent waiting during the service visit. In fact, wait time is even more of a frustration than dealer pricing or failure to provide a loaner vehicle. Dealerships of purchase are losing service business to other dealers that are closer in proximity to their customers. However, the percentage of consumers who say they prefer to service their vehicle at the dealer of purchase is higher than the percentage of those who actually visit the dealer of purchase. The service department is also critical to retention and repeat sales. In fact, 74% of car buyers who had their vehicle serviced by the dealership of purchase said they were likely to return there to purchase their next vehicle, while only 35% of those who did not have their vehicle serviced at the dealer said the same.2 The good news: In 2018, dealers have gained approximately 18.6M additional service visits compared to 2015. 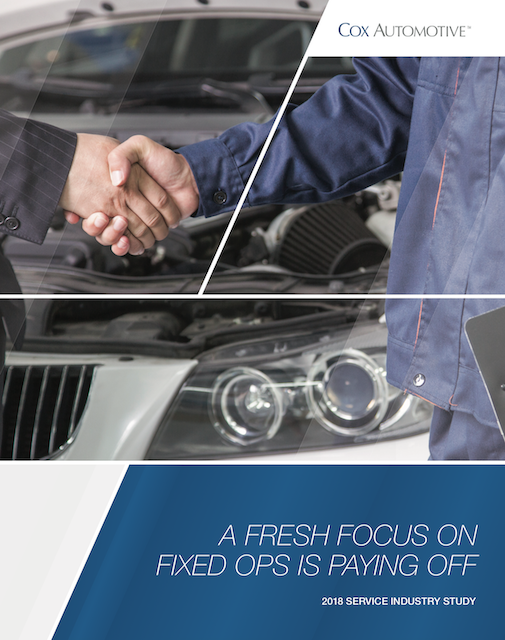 Building on findings from the Cox Automotive 2015 Maintenance and Repair Study, the 2018 Service Industry Study looks at five key trends that are critical to continuing the positive momentum in fixed ops that dealers have gained over the last three years. Since 2015, dealers have gained market share in both maintenance visits (oil changes, tires, general tune-up, batteries) and repair visits (engine, transmission, electronics). They have taken share from quick lube service centers in the maintenance category and from general repair shops in the repair category. In 2018, over half of dealership visits included at least two services per customer repair order — indicating that dealers are successfully cross-selling maintenance and repair services. Nearly three in five services completed at a dealership included an oil change, the most common type of work. Significantly, most of the oil change visits also included an additional service: Only 19% of service visits at a dealership were solely an oil change, a notable improvement over 29% in 2015. Dealer share of tire work, the second most common service done at dealerships, also has increased significantly since 2015 — an indication that dealers are becoming more competitive and by doing so are improving retention. An increase in vehicle recalls is likely contributing to the increase in dealer share of service visits overall. Since 2013, recalls have increased by 26%, which impacted 42.7 million vehicles. Additionally, the increase in services sold per visit illustrates dealer success in cross-selling more services per recall order — oil change and tires being the most popular pairing, followed by services with some combination of an oil change, inspection, scheduled maintenance and tires. Because recalls have increased substantially in the last five years, the task of balancing labor types in the shop schedule is becoming more complicated. Nearly three out of five dealers say that their share of warranty work due to recalls is higher than it was five years ago. This increase in recalls is a challenge to shop capacity and parts availability. Cross-sell services during maintenance, repair, recall and warranty service visits. 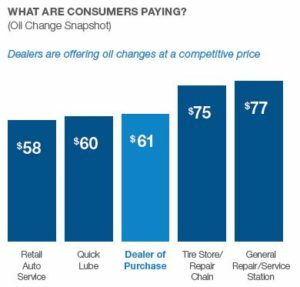 Since increase in dealer share of common services (e.g., oil change, tire service) suggest that dealership pricing is competitive with third-party providers, promoting competitive pricing and price match guarantees can enhance these opportunities. Use automated service reminders and recall integration to create customer awareness of critical vehicle maintenance and repairs while promoting retention and regaining lost customers. Partners such as Xtime, VinSolutions and Dealertrack can help implement technology to enhance customer satisfaction and generate manufacturer-pay work orders during regular service appointments and customer-pay revenue opportunities during recall visits. Set realistic consumer expectations regarding turnaround time based on parts availability and service department volume. When recall service visits strain shop capacity, consider offering amenities (e.g., complimentary detailing, loaner vehicles) to enhance customer satisfaction. Educate customers on the service(s) they will need at their next service appointment. 20% of customers are frustrated when dealers try to sell them additional maintenance and repair services during a service visit. Providing advance knowledge of which services they will need, and why, can help alleviate customer frustration. Research shows that consumers are negatively impacted by service department volume and inefficiency: Two of the top five frustrations consumers have with dealers are related to time spent waiting during the service visit. In fact, wait time is even more of a frustration than dealer pricing or failure to provide a loaner vehicle. Consumers who are most satisfied spend 2.5 hours or less at the dealer for service. This is important because there is a relationship between time spent on service and a consumer’s likelihood to return for their next service visit. But the margin for disappointment is small — just another 30 additional minutes and the consumer begins considering other providers. At 3.7 hours, consumers are definitively not coming back. Dealer capacity impacts customer wait times and most dealers are near maximum capacity. 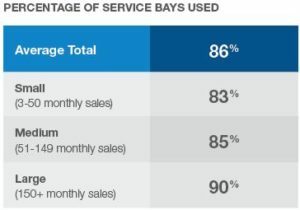 Dealers are getting nearly 19M more service visits a year and, on average, dealers with a single-shift shop say that 86% of their service bays are being used, indicating near-full capacity. Increased volume of service visits, maxed-out shop capacities, more recalls and rising consumer expectations have increased the need for dealers to work more efficiently. 62% of franchise dealers are concerned with increasing the efficiency of their service processes and 8-in-10 dealers are experimenting with ways to handle periods of high demand — the most common tactics being to offer weekend service and scheduling employee overtime. Increase service department capacity by implementing weekend hours and/or by adding employee overtime. Use technology to put customer data at the fingertips of service personnel. Integration between the service department and the CRM can ensure that customer and vehicle information is available at every customer touchpoint, allowing your staff to work more efficiently. Monitor and balance service labor mix to optimize shop performance. Hire service employees of varying skill and experience levels based on the dealership’s relative volumes of simple v. complex service orders. Strive to balance higher-grossing repair orders with simpler, higher-volume services that attract new service customers and boost retention. Set realistic consumer expectations of how long it will take to service their vehicle and provide them with timely progress updates. Address consumers’ expectations for speed, convenience and simplicity by implementing online scheduling and making customers aware that you offer this convenience. Partners such as Xtime can help implement tools to increase service department efficiency while boosting revenue and customer retention with online and mobile scheduling; service drive advisor check-in via tablet, text or email alerts; deferred service capture and marketing features; and advanced shop controls. Outsource reconditioning and detailing work so that service personnel and service bays are freed to focus on customer-pay and OEM-pay work orders. In 2015, location was one of the top reasons consumers said they did not return to the dealership of purchase for service. In 2018, location is becoming even more of a retention issue because the dealer of purchase tends to be farther away than consumers are willing to travel for service. Over 50% of customers drive more than 11 miles to purchase their vehicles, but less than one in three are willing to drive more than 11 miles for service, whether it be from work, home or school. Distance is becoming increasingly important for consumers who live in a world made more convenient by digital and on-demand services. In 2015, “Not a convenient location” was the fifth most common reason consumers did not return to the dealer of purchase for service. In 2018, “Not a convenient location” is the second most common reason consumers go elsewhere. 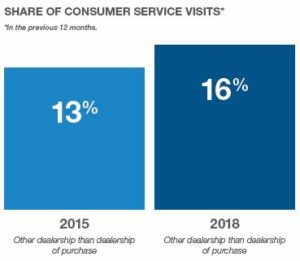 While dealerships have gained market share in consumer service visits over the last three years, this growth is driven solely by dealers who are not the dealer of purchase. As a result, service share is now split equally between the dealership where the vehicle was purchased and competing dealerships. Dealerships of purchase are losing business to other dealers that are closer in proximity to their customers. While service market share among the dealership of purchase hasn’t grown since 2015, research shows there is opportunity for growth. The percentage of consumers who say they prefer to service their vehicle at the dealer of purchase is higher than the percentage of those who actually visit the dealer of purchase. Ultimately, trust and a good purchase experience are the top reasons that customers return to the dealership of purchase for service. Focus on providing a transparent, no-pressure sales experience that builds customer trust and introduce car buyers to their Service Advisor as part of the sales process. Consider new and different ways to provide a convenient service experience that mitigates distance-related hassles (e.g., loaner vehicles, vehicle pick-up and drop-off, mobile mechanics, shuttles, ride-hailing services, etc.). Promote special offers on extended warranties and service agreements as a way to keep customers coming back to the service department. Develop a local service network with other dealers and third-party service providers where customers can use their service contracts purchased from your dealership, and/or consider investing in additional service locations. Over the last three years, the percentage of consumers who say owning a vehicle is becoming too expensive has increased significantly from 42% to 48%.3 Compared to 2015 when consumers said “Quality” was most important when selecting a service provider, “Value” is now the #1 deciding factor consumers consider when determining where to go for vehicle maintenance or repair. Consumer interest in coupons and loyalty programs has also increased significantly since 2015. Consumers and dealers agree that “Value” is proven through fair pricing, and research shows that dealers are pricing the most common services fairly. For example, an oil change at a dealership is priced competitively compared to an oil change at a Quick Lube shop. Promote transparent, competitive pricing and price-match guarantees. Use coupons and loyalty programs to attract and retain value-conscious service customers. Use quick-turn services (e.g., oil changes) to get customers in the door and create opportunities to up-sell more complex, profitable repair work. Increasingly complex vehicle technology has the potential to give dealer service departments an advantage: 62% of consumers who have advanced technology features in their vehicles prefer the dealership for service versus only 32% who prefer general repair shops. Promote your dealership as being uniquely equipped to perform the maintenance and repair services today’s technologically complex vehicles require (e.g., having the certified technicians, latest equipment, OEM parts, expertise, etc.). Position your dealership as having an advantage over other service providers when it comes to having the product knowledge to provide fast, high-value maintenance and repair services on high-tech vehicles. Cox Automotive Inc. makes buying, selling and owning cars easier for everyone. The global company’s 34,000-plus team members and family of brands, including Autotrader®, Dealer.com®, Dealertrack®, Kelley Blue Book®, Manheim®, NextGear Capital®, VinSolutions®, vAuto® and Xtime®, are passionate about helping millions of car shoppers, 40,000 auto dealer clients across 100+ countries and many others throughout the automotive industry thrive for generations to come. Cox Automotive is a subsidiary of Cox Enterprises Inc., a privately owned, Atlanta-based company with revenues exceeding $20 billion.